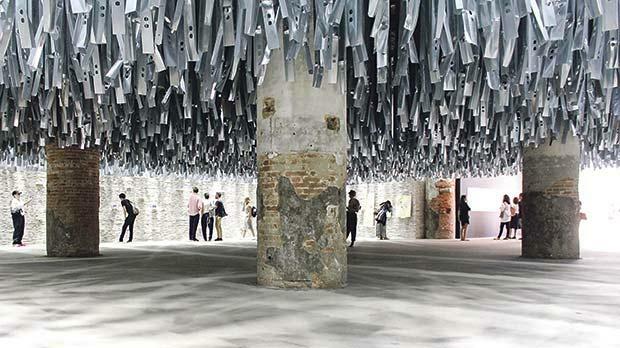 Naima Morelli gives us her top four pavilions at this year’s Venice Architecture Biennale. This year’s Venice Architecture Biennale offers many suggestions for the future of our living spaces as well as proposing solutions for global issues. The theme chosen by curator Alejandro Aravena is Reporting from the Front. Here are five of the most interesting pavilions present. While the British pavillion might look understated at first glance, it is the one that will have the most long-lasting impact on the public. Instead of looking at urbanism or architectural concepts, it proposes a paradigm shift. It starts from lifestyle design. The home and the economisation of resources are the point of departure. Five architectural firms imagine five different housing optimisations, depending on the time you spend in that given space. The show Home Economics makes you reconsider the definition of home in relation to contemporary needs, which are drastically different from those of our ancestor. Life is changing; we must design for it is the motto. Inside the pavillion, you walk through these five different ambiences driven by a clear and concise booklet that reads like a manual. The first home is more of a capsule and is designed to be occupied just for a few hours. Taking on the concept of the sharing economy, here you share everything, from furniture to clothing. For the increasing number of minimalists living out of a backpack, this is the way to go. For those finding themselves inhabiting the same space for a few days in a row, inflatable structures and Internet connection are the name of the game. The slogan is Home is where the Wi-Fi is. The ideal solution for the renting necessities of the digital nomad, this is a modular house to be occupied months at a time. 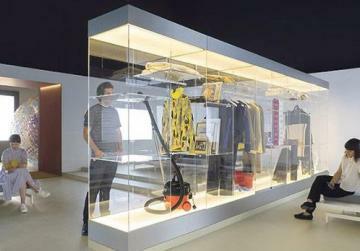 In this prepackaged unit housework is comprised in the rent. If you want a house to live in for a certain number of years, you might find yourself dreaming of an empty shell that can serve your long-term needs, but that can be also resold at your convenience. This idea is expanded also for a house to be inhabited for decades. Here there are no predetermined rooms for predetermined activities. Rather than be geared for a function, every space is about dichotomies. Light and dark, open and closed, private and public, wet and dry. Not dissimilar to the IKEA core concept, the British pavilion pushes for an architecture Renaissance in the sense that it is repositioning the human at the centre of the living space. 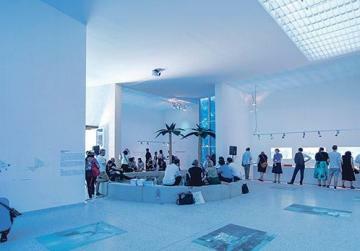 The Dutch pavilion, called Blue, is a must-see for breaking the nation-based concept of the biennale. Instead of reflecting on locality, the Netherlands identify themselves as first and foremost part of the UN. Curator Malkit Shoshan looks at prevalently African war-torn countries, where the UN is conducting peace-keeping missions. By looking at the self-sustained infrastructure the peace-keeping missions have built, the pavilion examines the political, military and economic attitude the UN has towards these African countries. The tensions or equilibriums created might or might not evoke the ghosts of colonialism or imposed capitalism. The pavillion is very conceptual and definitely not the most approachable. Its blue colour and showcase of maps and photographs of military bases don’t immediately communicate the number of consequences embedded in the action of UN forces. It might take some reading, but after a while it becomes clear how important are architectural choices in building these infrastructures. Often devoid of any aesthetic value, many of these UN camps are imposing a bureaucratic idea of safety, which the local population might not be enthusiastic about. The aim of these infrastructures – mostly menacing bulks – has changed over time. The peacekeeping missions went from being lightly militarised, low-budget operations, mainly located across disputed borders, to operating within the city on political, social and humanitarian levels simultaneously. Today, in the light of the so called “war on terror”, the peacekeeping missions have become highly militarised, operating within inhabited areas, consequently disrupting urban fabric. Along with security issues, the aim of the peacekeeping forces is to promote independence by establishing an economic and financial system linked to the global markets. The Dutch pavilion shows how global militarisation is coaxing politically-unstable countries into the free market. The show doesn’t ask ethical questions, but rather looks at the functionality of these areas, unromantically seen as economic vectors. The Nordic pavilion is by far one of the most welcoming. It is a relief in the overwhelm of information typical of any biennale. Curators were clearly aware that exhibitions don’t happen in a vacuum, hence they created the conditions for people to pause and really appreciate the work. You enter an open, essential space, featuring a series of vintage psychoanalyst couches on Persian rugs, each one with its own monitor – comfortable, isolated experiences in a shared space. In the videos architects discuss the commonality in the architectural approaches of Finland, Norway and Sweden. For these societies having reached a very high level of civilisation, this is what a front looks like. But, of course, even if in the European imagination Nordic countries have reached the self-actualisation level of Maslow’s hierarchy of needs – exemplified by a wooden pyramid at the centre of the pavillion – the point is not settling. It’s rather about keeping active, refreshing those values and making them relevant to contemporary life. 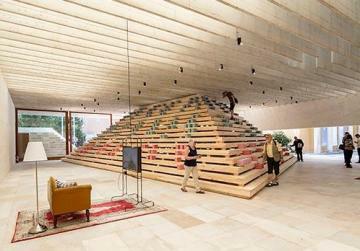 Walking on the wooden pyramid, the viewer can grab pastel-colour sheets detailing architectural projects. Each colour corresponds to a category on, again, the Maslow’s pyramid of needs. Under Foundational, you find architectures providing shelter, healthcare and education facilities. Belonging comprises buildings in which the society gathers. The Recognitions category includes all those buildings embodying the values these Nordic societies want to live up to. Concise and viewer-friendly, this pavillion has quickly become one of the most appreciated of the biennale, expressing its values also in the way it presents itself. The word Heimat is not easily translatable. In German the term means something between home and motherland and it denotes the relationship of a human being toward a certain spatial social unit. In the Germany pavililon, the idea of Heimat is not taken as a reason to enforce the peculiarity of Germans. On the contrary, the meaning of the term is enlarged to convey openness and inclusiveness. For this very reason the walls of the pavillions have been torn down, creating a number of passages. The gesture symbolises the opening of national borders with a particular reference to the current refugee crisis. We know that Germany is the epicentre of migrations towards Europe. It is, indeed, an arrival country, unlike the biennale-hosting Italy which is considered a country of passage. 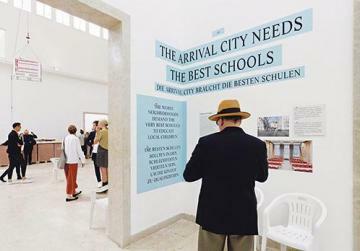 In order to deal humanely with the migratory fluxes, Germany shares with the world its insights of what are the applicable features of an arrival city. Drawing from the book Arrival City: How the Largest Migration in History is Reshaping Our World, the exhibition comprises actionable slogans (“The arrival city is a city within the city”, or “The arrival city is informal”), as well as personal stories of those who make Germany their heimat. Important prerequisites of an arrival city are affordable housing, access to work and public transit, small-scale commercial spaces, networks of immigrants from the same culture and a tolerant attitude that extends to the acceptance of informal practices. This idea of openness is almost moving in its calling for the instinct of helping and welcoming the stranger. The willingness to exchange ideas and pragmatically look for a solution is just as touching. It shows in a vulnerable but assertive way that Europe is interested to became a resilient force for good.